When Allo 9.0 arrived earlier this month, there wasn’t much to talk about. Aside from bug fixes and performance improvements, the update brought nary a new sticker pack to play with. But as it turns out, Google is doing some serious work behind the scenes. 9to5Google has taken a deep look at the APK and found some interesting features in the works. Most importantly, Google seems to be nearing the formal release of the Allo web client. A feature we first heard about from Google’s VP of Communications Product Nick Fox, it appears as though it will function similar to the way WhatsApp’s does, requiring a specific code scan to authenticate. 9to5Google was able to enable the feature, which prompted to scan a QR code or text code to pair with the desktop. While the site obviously couldn’t get beyond the pairing screen, it does suggest that Google is fairly far along in the development of the Allo desktop. In his teaser tweet back in February, Fox said the Allo desktop client was “still in early development,” but this discovery might mean its release is closer than we think. 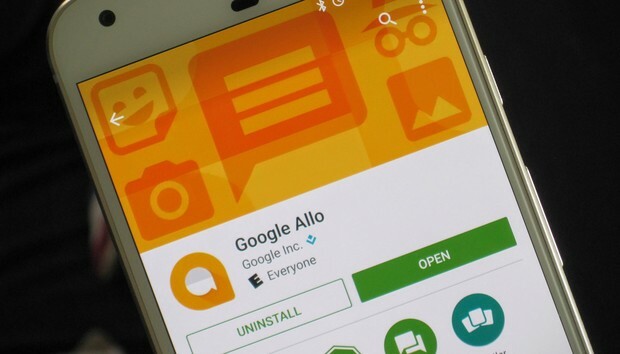 Elsewhere in Allo 9.0, 9to5Google found an intriguing reference to back up your chats to Google Drive, which look to add the ability to sync saved conversations (including any images and videos) to a new phone. The APK teardown also included references to incognito group chats and the long-rumored selfie-generated sticker packs. Something to talk about: We’ve been trying to figure out Google’s messaging strategy for as long as we’ve been using Android phones, but at least the Allo picture is starting to become a little clearer. What isn’t clear is where the app fits. Google recently started a push to make Android Messages the default on all Android phones, so Allo is presumably still playing second fiddle in its overall strategy. But with Google I/O right around the corner, perhaps Google will shed a little more light on it.